How to catch these awkward fish with minimum stress and effort. I have been keeping and breeding various species of Hillstream Loach since 1999 and during that time I have been continuously frustrated at watching the employees of various fish stores use inefficient methods for catching these fish. This usually results in excessive stress for the employee, but more importantly stress or damage to the fish. In both cases this is undesirable. An employee, or indeed the proprietor of the shop may have to catch hundreds of fish a day, may have customers waiting and anything that increases efficiency will reduce stress and ultimately increase profit which is why the business exists in the first place right? unusual which means they sell. They are a specialized fish both in habits and aquarium requirements and whilst the retailer cannot control how they are kept once they leave their shop, they can ensure that the fish’s stay in their shop and their capture for bagging for the customer are done in a kind and efficient manner. Stress and/or damage to the fish can result in early demise and a dissatisfied customer......not something any business needs. Moreover it must be remembered that we are dealing with living organisms and they should be treated with the utmost respect. Catching these fish in a home aquarium, should one require to move them is not going to be easy because most decorative tanks will contain a lot of decor or plants providing numerous hiding places and escape routes for these fast moving and highly evasive fish. Dealers normally have far barer tanks and because the fish are generally in those tanks for a short time they tend to use their natural ability of sticking to smooth surfaces as their primary means of evading capture. Their best defense is the aquarium glass itself and generally they will suction onto it with all their might and refuse point-blank to let go, even if slid up out of the water. Different species vary in the doggedness with which they will maintain this tactic, but generally the more compressed species are the best at sticking like glue. This natural ability can be used to the advantage of the person who is catching the fish. Once stuck to the glass, the fish tend to stay still or just move by shuffling along the surface. If you try to get a net under them there is a high risk of damage to the fins or the fish’s body which can result in possible infection. A net is just too thick along it’s frame edge. The fish can usually be encouraged up near the water’s surface and at this time, it’s only way out is down towards the net.......but it won’t let go. I have found that sliding a plastic credit card down the glass from above, gently pushing against the fish’s fins will cause the fish to lose suction and flick itself off the glass towards the net. 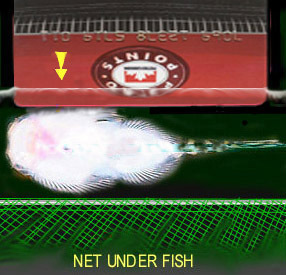 It’s best to position the net so much of it is toward the front of the fish as they tend to go down and forward at the same time. All you have to do is move the net upward as the fish lets go and lift it from the tank. Using this method it is possible to catch the fish quickly and without damage. This means that these fish, which are often stressed by wild capture and transport have one less stressor to deal with. This can lead to earlier settling into a captive environment and hopefully a long life. For the dealer, it means that his staff get more satisfaction by efficiently capturing the fish plus they are available sooner to serve the next customer. The new Hillstream owner takes home a far less stressed and undamaged fish, plus the other inhabitants still in the dealer tank don’t have to endure the stress of a net zooming all over their tank chasing other fish for an unnecessarily long time. Everyone wins using this method of catching.........not something that’s always easy to achieve in fish-keeping. There is a lot of arguments these days about certain species of fish being imported and sold for home aquaria that require specialized housing or husbandry. Mainly, these arguments are directed towards species that grow excessively large for "normal" size aquaria. Hillstream Loaches are not one of these "Tank-buster" fish, usually remaining under 3 inches, but do require specialized care. Many fish dealers are still not aware of these requirements and I urge you please to read my other articles on these fish. If you have had difficulty in maintaining these fish in your shop, possibly the information above will allow you to improve the well-being of your stock, reduce losses and educate your staff and customers as to their requirements.